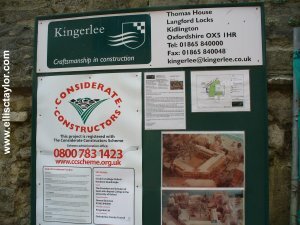 In quick-smart fashion the builders, upright and square, Kingerlee (clock the logo, would ya) were requested to fill it all in and get on with the job, which they are. In March 2008, a heap of up to 40 bodies were unearthed during the groundwork phase. By law, even for an Oxford money-bags like St. Johns, work had to stop. The college was torched during the Dissolution before literally rising from the ashes with a name change and a dedication to the Templar/Hospitaller divine, ‘John the Baptist’ in 1555. 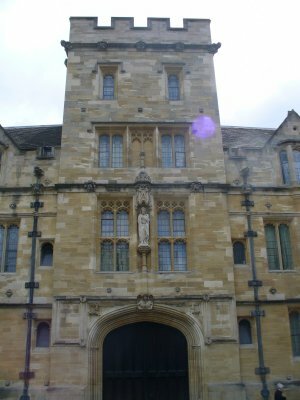 St. John’s College is extremely rich. It is said that a traveller could walk from St. John’s, Oxford to St. John’s, Cambridge without stepping off this institution’s wallet. On St. John’s Day, 24th June, 1646, the Royalists surrendered to the Parliamentarians at Oxford. 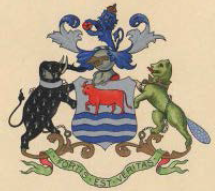 King Charles (answering to the alias ‘Harry’) had travelled east legged it escaped out the East Gate passed Magdalen College, and across the Cherwell – slipping through Marsh Baldon on the way. The site where the Henge was uncovered is between numbers 20 to 22 St Giles, which is a little north of the actual college. It is on land where at one time ‘Black Hall’ stood. This surprise discovery has occurred in exactly the right location for these times – one long marked and inscribed to the herald of Christ, St. John the Baptist (a water-carrier), and ostensibly for a major new building dedicated to a person whose first name matches the college’s, and surname means ‘the son of man’ – (Kendrew)! With the building of this quad, precisely where this revealed great circle is located, in full public view, St. John’s (the college of the Templars) are moving to square the circle! As I have been relaying, Oxford is ‘the Womb of the World’ and the New Age, of Aquarius, the water-bearer, will be initiated here. Indeed it could be argued that the decidedly unpopular (amongst local citizens past and present) St. John’s is a water-bearer itself, being named after the Baptist. Very close to the Oxford Henge long barrows, round barrows, and other ritual sites have been discovered, in what is now known as the University Parks, and under Wycliffe Hall, in Summertown, under Ss. 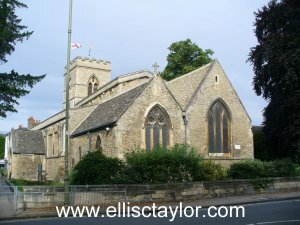 Philip and James Church in Woodstock Road and on Port Meadow. The site is only a stone’s throw (not one of those big ones. If it is I ‘ent chuckin’ it!) from the 12th Century, St. Giles Church, which might help to explain the dismay that social and religious historians have long expressed regarding the necessity of this large church so close to St. Mary Magdalen’s Church, which is also outside the old city boundary. Was St. Giles built on the henge site, or on top of something associated with it perhaps? Oxford, and its environs, has been like a candle to moths in regard to religious orders of every creed, clandestine or otherwise. The colleges were mainly founded by, or under the influence of, clerics – they still are in many ways. Away to the west, on a wicket-straight alignment – Ley Line – that bowls its way through ‘the Oxford Henge’ is the hauntingly beautiful, yet austere little church of St. Margaret of Antioch in Binsey. A Queen’s kin by and by. The church building, these days, is a long way from the village it serves but once-upon-a-time, the whole village, like its neighbours Osney and Hinksey, was entirely isolated. 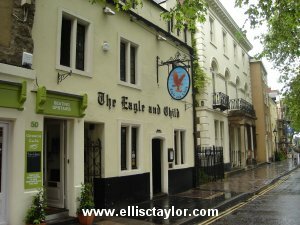 Like them it was built on an island in those then untamed and misty wetlands of Oxford’s original marshes and meres. 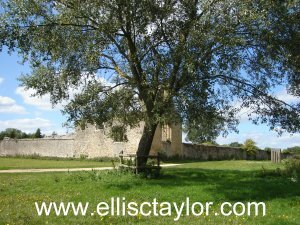 It was to here, so the legend goes, that Frideswide fled and it was in this little place, supposedly in the oak forests – which is unlikely – that she was accosted by King Algar. Here at this sacred spot, we are assured, below Wytham Woods, she struck the ground and a spring sprung which she used to restore the sight of the over-eager-Algar. 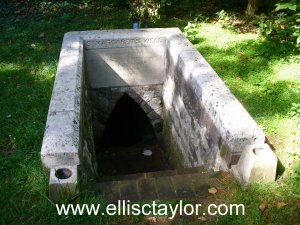 This spring became a holy well which Frideswide dedicated to St. Margaret – and Charles Dodgson (Lewis Carrol – L.C. – Elsie) on 4th July 1862, to ‘Treacle’, in the Otherworldly jaunt he and his boating companions took to Wonderland. The first recorded vicar of Binsey was Nicholas Breakspear who became Adrian IV, the first and only English Pope, in 1154. 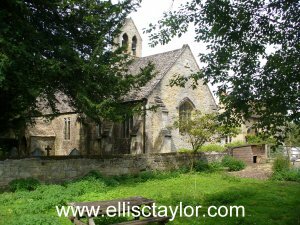 Nearly 5 centuries after Frideswide, in 1130, an anchorite named Lady Edith Launceline lived by St. Margaret’s church and holy well. She was given a small island, by John of St. John (note the name) to build a nunnery, a mile or so north, which was dedicated to St Mary and St John the Baptist, for nuns of the Benedictine Order. The site she chose was befitting of her name. She said it is where she saw a shaft of light strike the ground. A lance-line is also incredibly descriptive of a ley line, and as you might expect, Godstow Nunnery features. The Nunnery was consecrated in 1139 and was made famous by the romantic tale of ‘Fair Rosamund (Clifford)’ – ‘the Rose of the World’ – tragic mistress of Henry II. So, according to TVAS, the henge, in old money, is between 160 and 165 yards in diameter surrounded by a ditch (a moat I was told privately) that is 8.8 yards wide and just over 8 feet deep. Anyway, without all the maths, just a squizz at a map will tell you that this henge is bigger than the measurements they are quoting. It’s something like 300 metres, if it is going to cover the buildings mentioned, so perhaps the report intended to say 150 metres radius. If I’m wrong, then I’m wrong but if I’m not we’re talking iron-age city here, I think; and that is mind-blowing. The henge is located in Oxford University’s ‘Science Area’, which though it may be mostly old and look it, is at the cutting edge of all things scientific, and that includes ancient and modern investigative practices, techniques, and means of study. All of life on earth, since as far back as science can go, is represented by artefacts, fossils and DNA here. Yet we are being encouraged to believe that under their feet, without their knowing, are the remains of one of the biggest constructions ever undertaken by people in Britain? I don’t buy it. This ‘monument’ is gargantuan and it isn’t as if there aren’t indicators that there could have been something else lying around. Just on the doorstep, in the University Parks, only yards away some of them, are barrows and ring ditches; earthworks concentrations that regularly indicate the presence of something very significant nearby. So, why did this prestigious University, of world renown, spring up here? What was the attraction?…Could it be that it is because this ‘Centre of Learning’, this ‘Womb of the World’, this ‘Fisher of Men and Women’, that was invisible to the Luftewaffe in World War II, and the mint bolt-hole of Charlie 1, aka Harry, just so happens to be, at least, adjacent to the (supposedly) recently unearthed, Oxford Henge – and I feel, in a major way, right inside a concentric pattern of circles, yet to be revealed publicly? We are told that all of Keble College is enclosed within the exposed, but now hidden again, ring, as well as Pitt-Rivers -so the University Museum too (see map in Science area link). It’s all so very interesting…and suspect. Students of ‘Earth Energy’ know that images of St. Michael and the Dragon (also his lance, often) are prevalent symbols in places connected with the energy streams of ælvean (my attempt at spelling how we pronounced the very ancient name of Britain, in a time before writing). Within the ring of the henge a more modern school, the Oxford Preparatory School, first began. Only two rooms, at what was 26 St. Giles, opposite St. Barnabas Church, at the cusp of the Banbury Road. It was September 1877 and what was soon to become the Dragon School had been hatched. I find this dragon connection quite remarkable…and very cool. *The school’s website, in an unconvincing manner, attributes the origin of the name to the group of founding dons who they say dubbed themselves “the Dragons” – because their head was called Mr George. they reference the book wot they wrote, “A Dragon century, 1877-1977“, as the authority for this. (4) Elizabeth is also the name of John the Baptist’s mother. 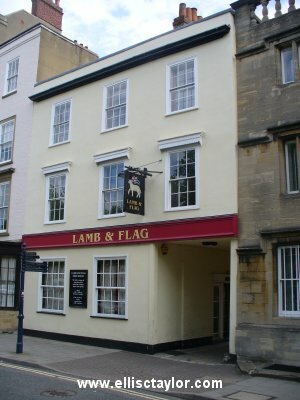 Both the Eagle and Child and the Lamb and Flag were meeting places for the famous ‘Inklings’, a group of writers that included C.S. Lewis, J.R.R. Tolkien and Roger Lancelyn Green. Thirty-seven skeletons found in a mass burial site in the grounds of St John’s College may not be who they initially seemed, according to Oxford researchers studying the remains. The north side of Oxford has traditionally been the site of executions (sacrifices). The famous martyr sacrifices (Cranmer, Latimer and Ridley), as well as many others, took place just outside the city wall here. It’s the side without a river in later times – so the more vulnerable side. Was this a consideration in more aware times (for sacrifice)? The North Gate: Looking from St. Giles into Cornmarket St. This entry was posted in alignments, Ancient, Ceremony, Ellis Taylor, Mysterious, Religion, Sacred sites, Uncategorized and tagged Alfred the great, algar, Arthur Quiller-Couch, binsey, canute, danelaw, danes, dragon, Dragon School, fair rosamund, kendrew, King Aethelred the Unraed, King Ethelred the Unready, lance, lewis carrol, observatory, oxford, oxford henge, radcliffe hospital, slavery, St. Barnabas, St. Giles, st. john's college, st. michael, st.margaret, vikings. Bookmark the permalink. I dunno Floria, but my feeling is that they only appear to be failures, from our contained perspectives here. Thanks for the book suggestion.